Rock Band developer Harmonix will see another $208.7 million this year, thanks to the terms of its deal with Viacom, who acquired the developer in 2006. Harmonix was originally purchased by Viacom division MTV Games for $175 million, but according to a GamesIndustry report, Viacom's Form 10-K revealed that target-based incentives were also part of the deal. "In addition, to the extent financial results exceed specific contractual targets against a defined gross profit metric through 2008, former Harmonix shareholders will be eligible for incremental earn-out payments with respect to the years ended December 31, 2007 and December 31, 2008," the 10-K statement said. On top of that, Viacom is expected to make another payout in 2009 for the game's performance over 2008. 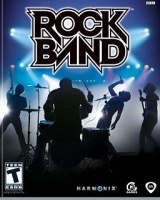 Despite difficulties surrounding the game's release, Rock Band was one of the biggest releases in 2007, receiving universal acclaim and selling more than 1.5 million units across the PlayStation 2 and 3, Wii and Xbox 360 platforms. The success of the game has been further bolstered by the growing library of downloadable content for the PlayStation 3 and Xbox 360 versions of the game, which has seen new songs released for the game on a weekly basis.